When people dismiss New York City and its denizens as pretentious, self-absorbed, hipster snobs who only pull their noses out of their own rear ends long enough to look down on Gotham outsiders, it's because of derivative movies like The Art of Getting By. Freddie Highmore, so charming alongside Johnny Depp in Marc Forster's delightful in Finding Neverland wallows here as George, a fatalistic high-school teenager questioning the futility of existence. Unwilling to burst his own bubble of arrogance and fall in step with reality, George rebuffs his frazzled mother (Rita Wilson), resists the encouragement of his teachers (one of whom is played by Alicia Silverstone), and trades condescending verbal jabs with a concerned principal (Blair Underwood) who is at the end of his rope with this gifted but jaded student. George's miserable outlook on life softens somewhat when he meets Sally (Emma Roberts), a fair-skinned beauty who wouldn't give a trench coat-sporting loner like George the time of day if not for the fact that the script insists that she does. At the same time, George witnesses his potential future in Dustin (the great Michael Angarano), a successful painter and alum of George and Sally's school who mentors the former and romances the latter. It isn't hard to imagine where the plot is going to take you at this point and to say that it is in any way refreshing to watch is untrue. It is interesting, at the very least, watching young actors like Highmore and Roberts find their niche. In time, and with better choices, Highmore could reach the level of Angarano, who showed promise in kid flicks like Sky High and parlayed those experiences into worthy roles in Snow Angels and on FOX's hit show 24. As for Roberts, she needs to stop playing the superficial muse of the morose Manhattan teen, the type of teen who only exists on the pages of phony, disconnected, urban coming-of-age screenplays where kids skip school and catch film retrospectives at the local art house theater. Between Art and the similarly detestable Its Kind of a Funny Story, this young actress is just getting by ... at best. On Blu-ray the movie looks fantastic but that isn't any surprise now-a-days with the level of product coming out of Hollywood. However the bonus features leave something to be desired only sporting a character look at Highmore, a very brief doc on the making of the film, audio commentary from the director and a theatrical trailer. So for yet another film featuring teens who constantly bemoan the woes of their existence, The Art of Getting By does very little in the way of keeping you interested. Download The Art of Getting By from the iTunes Store in Digial HD. 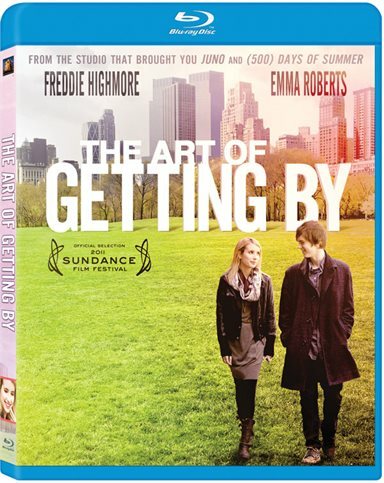 For more information about The Art of Getting By visit the FlickDirect Movie Database.